Okami is a joy to play and delivers not just a great adventure but along the way actually boosts your sense of well-being as you bring life to the plants, people, and flowers of the world. This is a thoroughbred classic game that deserves to be experienced by as wide an audience as possible; if you missed it before then this new HD version is the best way to experience such an engaging game – don’t miss it this time. Okami HD was great on the PS3, but is even better on the PS4. This may finally be the definitive version of the game. 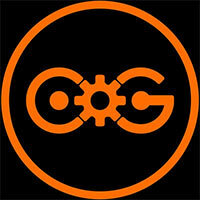 Motion controls have been dropped, but then again they didn’t really feel like they belonged in the first place. Sure, this is essentially the same game for a third packaging, but if you missed the remaster, and especially if you never played the original game, Okami HD cannot come any more highly recommended. Even though there aren’t too many new features to justice this re-release, Ammy’s quest to defeat Orochi and cleanse the world of corruption is still every bit as compelling as it was a decade ago, and to those unfamiliar, this is the perfect opportunity to get acquainted with the most adorable wolf goddess you’ve never heard of. So how about that sequel, eh, Capcom? Okami was criminally overlooked back in the day, in spite of how well received it was- a great many people never got to play it, which is a crying shame. Okami HD, however, is the perfect opportunity to experience one of the most innovative and enjoyable games of the last few years. It’s rare to come across a game that is over a decade old that somehow manages to feel perfectly in line with the quality of experiences you’d expect even today, but that is exactly what Okami HD is. That’s a minor grievance though, a single patch of cloud in an otherwise beautiful blue sky of a game. If you’ve played Okami before, I promise it’s just as good -if not better- than you remember. If you’ve never spent any time with this game, though? Good god, what are you waiting for? Okami is art in motion, a triumph of gameplay and graphics that will hole up in your brain for months and years to come. Either way, Okami is an easy, wholehearted recommendation for me to make. 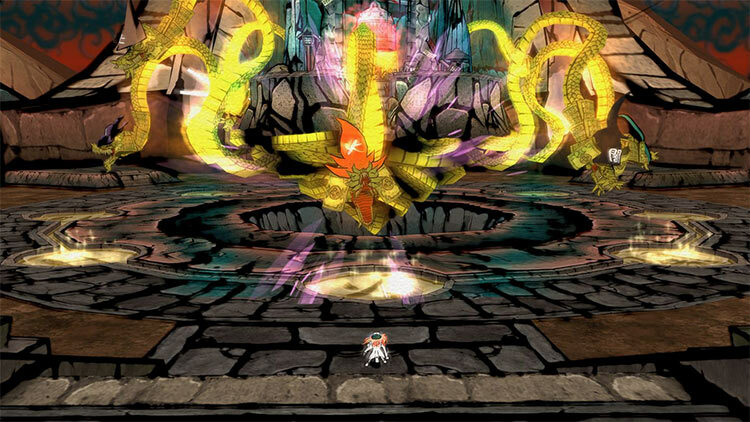 Okami HD is the best version of Hideki Kamiya’s unforgettable production. A combination of art and gameplay which appeals because of its stunning visual style and ground breaking interaction between players and the world of the game. Longtime fans will not find many new features apart from returning mini-games, better visuals, and a seamless graphic performance, but it is a specially good chance for new generations to discover one of the most unique video games of all time. 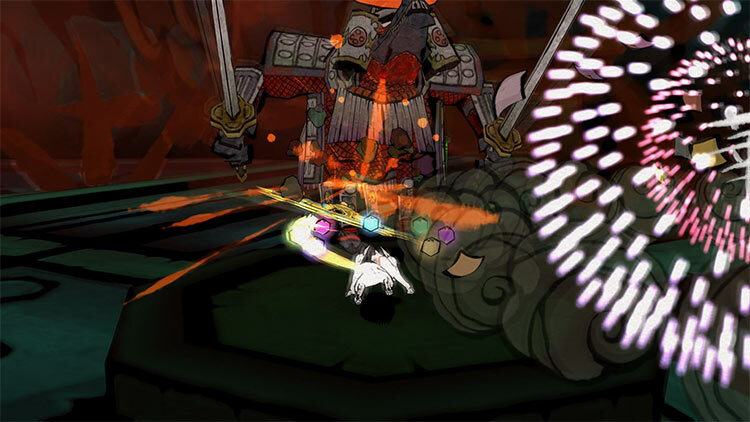 Okami HD delivers a definitive version of a title already verging on perfection. Its lush woodcut-inspired visuals, animated cast of characters and individual brush mechanics paint it as a masterpiece worth returning to even 11 years after its initial release. A few minor issues persist, and it would have been nice to see some exclusive content to distance itself from other past ports, but it doesn't detract from what is one of the most stylish and memorable games of the last decade. Okami is a truly beautiful game and it's in its best possible form with this absolutely stunning 4K remaster. Okami HD is something truly special; the sort of game that is still remembered fondly years later by those who play it, and wonderful in every aspect. While remasters often get a bad rap, classics like this deserve the chance to get more sales - especially if it increases the chance of a sequel - not to mention more players get to experience an amazing and memorable adventure. This is another chance for one of the most underappreciated adventures to appear on a PlayStation console to gain a new, much deserved, audience. Time has been fairly kind to Okami despite minor gripes. 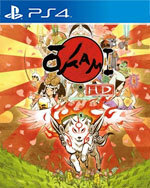 If you've yet to experience the wonderful world of Okami, then this is as good a chance as any. 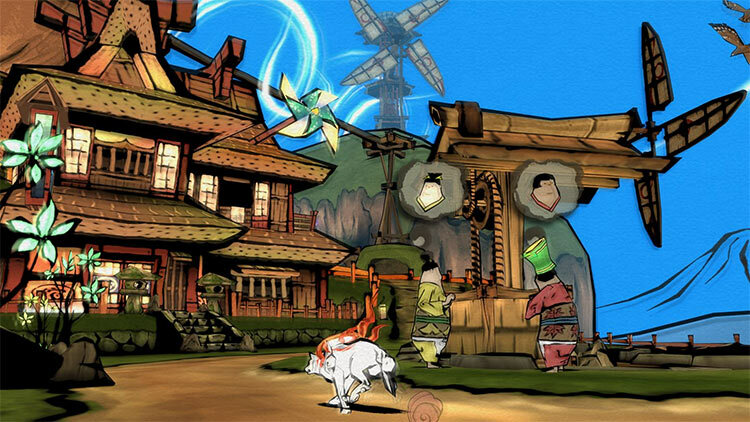 Okami HD is a good action game, but it is a better game about how a dog can enhance a life. Ammy is a wonderful protagonist with a natural puppy charm, one who steals every scene with her playful yet serene expressions, and through her big heart improves the lives of those around her. She digs up the yard sometimes and barks a lot, but she means well, making the world a better, happier, brighter, and funnier place. El desarrollo de Okami puede parecer demasiado sencillo y aún así, tiene una magia especial, que nos ha vuelto a atrapar tanto tiempo después. 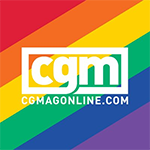 Es un juego único, que sabe rendir tributo a la tradición en cada uno de sus aspectos: argumental, visual, sonoro e incluso en el desarrollo. Como tal, son pocas las adiciones y mejoras que ofrece esta reedición de Okami HD para los sistemas de actual generación. Sin embargo, eso no evita que el juego siga luciendo fabuloso y ofreciendo una aventura memorable que, ahora, está al alcance de más personas.Si eres de aquellos que jugó Okami en cualquiera de sus presentaciones previas y no quedó atrapado por su majestuoso mundo y narrativa, entonces es un hecho que esta versión no te ofrecerá nada que justifique su compra. Además, poder utilizar el control táctil o el sensor de movimiento para hacer la experiencia más satisfactoria siempre es una buena noticia, pues estamos ante una de las aventuras con sabor The Legend of Zelda más mágicas y diferentes que hemos tenido el placer de disfrutar. Y es que hablar de uno de los juegos más destacados de la carrera de Hideki Kamiya son palabras mayores. Si lo has jugado recientemente –en especial con su adaptación a PS3-, no presenta grandes novedades y es difícil argumentar que merece otra compra, pero creemos que un juego así merece aparecer en más plataformas actuales. ¿Quién sabe si el Ōkami HD logrará dar luz verde a ese Ōkami 2 que Kamiya tiene en la cabeza? 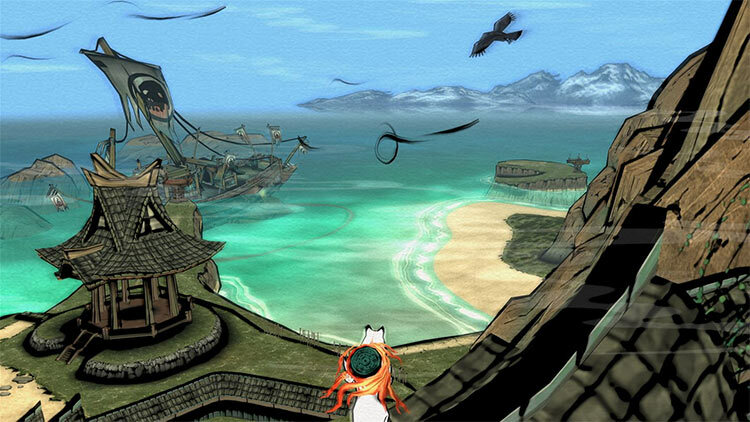 Okami sigue siendo una obra maestra que merece la pena ser jugada. Sin embargo, ha perdido el impacto que tuvo la versión para PlayStation 3 y su conversión a HD. Por mucho que las 4K nos permitan ver la genialidad de Clover Studio en su máximo esplendor, no justificaría la una nueva compra, con algunas decisiones incomprensibles como no subir la tasa de frames a 60fps, carecer de control táctil para suplir el de movimiento o seguir sin localización al castellano. Obwohl es in so vielen Bereichen an Zelda erinnert, ist es künstlerisch wesentlich markanter, zeigt das ebenso bizarre wie zauberhafte Gesicht Nippons. Es ruht zwar auf dem klassischen Gerüst von freier Erkundung, Kampf und Belohnung, aber es ist stilistisch einzigartig, in seinem Weltdesign märchenhaft interaktiv und aufgrund der Maltechnik erfrischend innovativ. Ôkami n’a rien perdu de sa superbe. C’est même tout le contraire. Magnifié par une refonte HD de haute volée, le jeu développé à l’origine par Clover reste un "Zelda-like" qui n’a rien à envier à la licence de Nintendo. Univers charmant, réalisation et level design excellents, bande-son mémorable : on voit mal comment ne pas accrocher aux aventures de la déesse louve Amaterasu. Après, la légitimité de ce re-remake reste assez discutable puisqu’il n’apporte rien hormis la 4K. On va être francs : cette version Switch est probablement la meilleure version existante d’Okami. Le lissage graphique est évidemment appréciable, mais c’est surtout le jeu au doigt qui apporte un plus non-négligeable. Plus précis, plus naturel, il corrige le seul véritable gros défaut du jeu original, faisant de cette version un must-have absolu pour celles et ceux qui ne connaissent toujours pas Okami. Définir Okami revient à le targuer d'une foultitude d'adjectifs tant l'aventure proposée est élégante, apaisante, poétique, délicate, gracieuse. Ayant aussi bien soigné le fond que la forme, Clover a créé une pièce maîtresse dont il convient de saisir toute la portée. Aussi trépidante qu'intelligente, aussi originale que généreuse, aussi drôle que sincère, l'oeuvre en question surprend, enchante, amuse et marque la rencontre de développeurs avec leur public. La plume virevolte, l'encre coule et la magie opère... Sans précédent. Si graphiquement, le jeu n’a que très peu évolué, côté gameplay, rien n’a changé non plus. Dans la structure et la narration, Okami n’a jamais caché ses inspirations envers la série Zelda, dont il voue un respect profond, et c’est avec un plaisir certain que nous nous sommes replongés dans cette quête initiatique. On aurait aimé en revanche jouir d’un frame-rate à 60fps, mais les développeurs ont décidé de bloquer le jeu à 30fps pour des raisons purement techniques. In ogni caso vale il solito principio, già più volte sentito in occasioni simili: il consiglio d’acquisto della remaster è da indirizzare solo a coloro che non hanno mai sentito parlare del gioco in questione. A coloro che invece già lo conoscono o ne possiedono una copia (che sia PS2, PS3 o Wii) non ci sono ragioni per cui dovreste riprenderlo. Immortale nell'aspetto e nella forma, Okami è ancora oggi un'epopea meravigliosa, che svela le sue caratteristiche migliori allo stesso ritmo con cui Amaterasu rivela i meravigliosi colori di Nippon ad ogni battaglia, ogni pennellata, ogni enigma risolto. Il fatto che questo titolo sia in grado di distinguersi persino all'interno della lista di opere dirette da Hideki Kamiya dovrebbe già dar da pensare, ed è bello constatare come, una volta superato il letargico inizio dell'avventura, ci si trovi ancora davanti a una lucidissima e gigantesca gemma. Sonuç olarak Okami HD, oynaması eğlenceli ve görsel olarak hayran bırakan bir yapım. 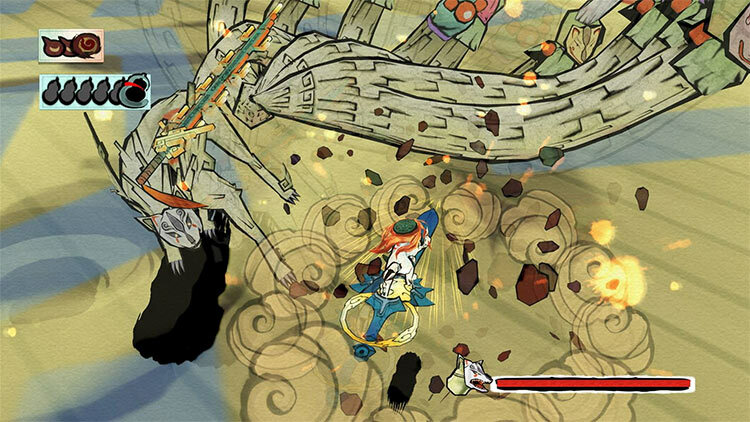 Eğer oyunu oynama şansına sahip olmadıysanız veya eskiden oynamış olup tekrar oynamayı düşünüyorsanız, Okami HD'yi tavsiye ediyorum. Okami HD w wersji na PS4 nie posiada zbyt wielu usprawnień względem wersji na PS3. Jednak nadal jest to niezwykle klimatyczny tytuł, po który powinni sięgnąć wszyscy fani gier akcji nie mający wcześniej styczności z tym tytułem. Z najnowszą reedycją Okami spędziłem osiem godzin. Jest to oczywiście zbyt krótki czas na ukończenie całej gry (na to potrzeba około 40 godzin), ale wystarczający, by zauważyć ewentualne różnice między tym a poprzednimi wydaniami. 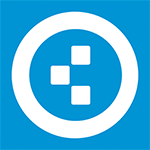 Trzy lata temu przeszedłem całą grę na PlayStation 3, a około dekadę temu oryginał na PlayStation 2. Uważam go za jedną z najlepszych produkcji wydanych na tamtą konsolę.